The University of Illinois Springfield online Computer Science and Management Information Systems graduate degree programs rank highly in the first-ever survey of national online programs by U.S. News & World Report. The magazine undertook the project in an effort to begin filling the information gap about the strengths and weaknesses of online programs. Overall, the Computer Science master’s program ranked eighth in the nation for “Student Service & Technology” and twenty-first for “Teaching Practices & Student Engagement” in the Computer Information Technology category. The Management Information Systems program ranked twenty-seventh best in the country for “Teaching Practices & Student Engagement” and forty-ninth best for “Student Services & Technology” in the Business category. In evaluating the “Student Services & Technology” category ranking, U.S. News looked for programs which incorporated diverse online learning technologies and provided great flexibility for students to take classes by the methods of their choosing at the times of their choosing. Technology, such as having all courses centralized into a single system, such as Blackboard, was also a key factor in the ranking evaluation. The “Teaching Practices & Student Engagement” ranking included factors, such as promoting student participation in class and allowing opportunities for students to readily interact with instructors and fellow classmates, as if they were in a traditional classroom environment. The category also includes implementing policies that ensure students are getting credit for doing their own work in the online environment. The online Computer Science master’s program at UIS focuses on software and is geared towards students interested in the design, analysis, and implementation of software programs. Out of the 275 current Computer Science graduate students, a total of 146 or 53% are online students. The Management Information Systems (MIS) program is specifically focused on providing a balance between technical skills and knowledge of business functions and processes. 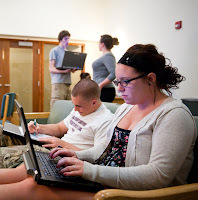 Out of the 190 MIS students currently enrolled at UIS, a total of 144 or 75% are online students. For more information on the U.S. News and World Report rankings, contact Ray Schroeder at 217/206-7317 or email rschr1@uis.edu. UIS looks back at a "Year in Video 2011"